I think this Mediterranean tile and flowers cake may be one of my favorite cakes I’ve made to date. 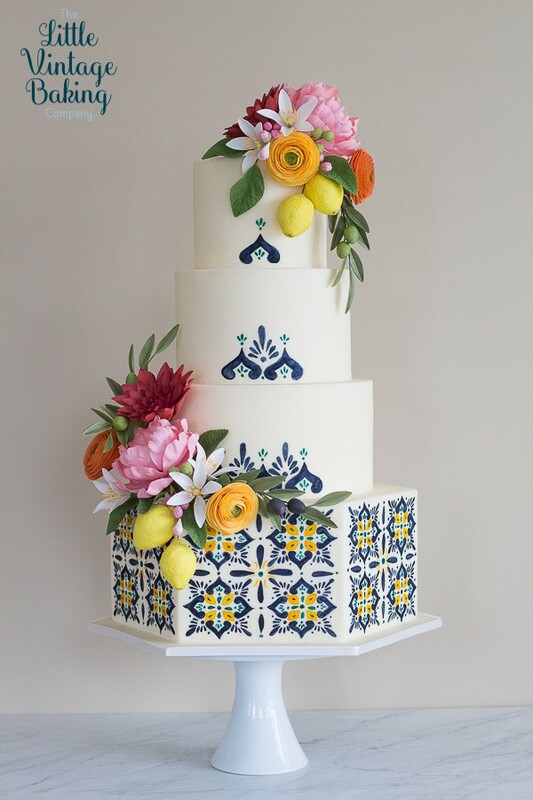 I don’t get to hand paint on cakes very often and was super excited for the chance to do so for this Mediterranean themed wedding. The color palette consists of dark blue, mustard-yellow, and turquoise with bright pinks, reds, oranges and yellows for the flowers. 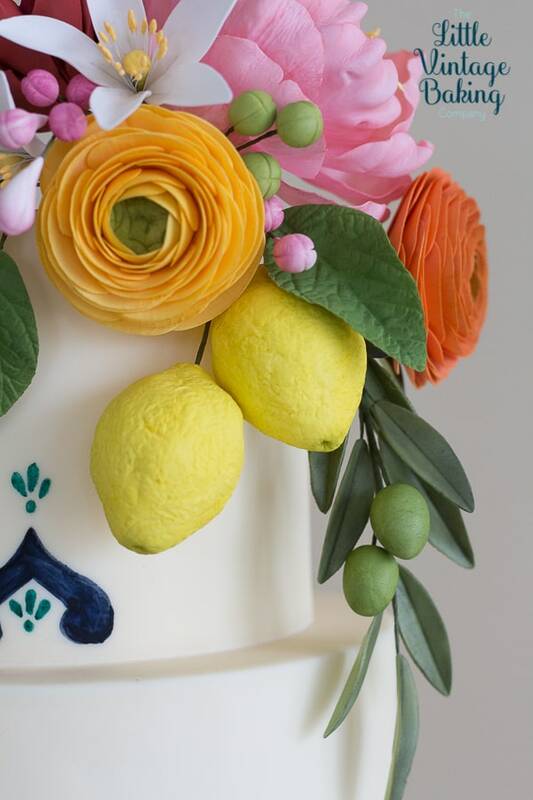 I wanted to incorporate both lemons and olive leaves for more of a Mediterranean vibe, which were both part of the wedding decor. Inspiration for the tile is designed based off of elements I pulled from the invitations and also the decorative plates that were planned for use at the wedding. Then, keeping the hexagon panels size in mind, I sketched out a design on sketch paper. Once I was happy with the design, I traced over the sketch with tracing paper. Parchment paper will work as well, but tracing paper is lighter and a bit easier to work with. 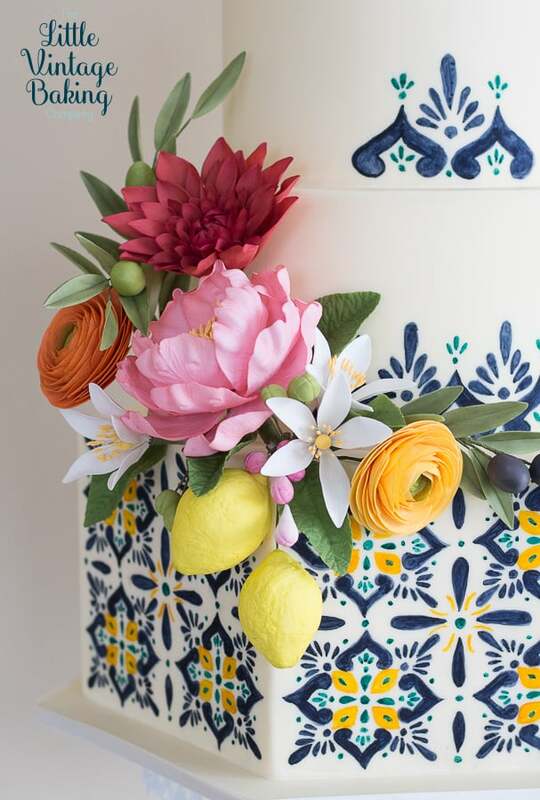 For the flowers and foliage, I made pink peonies (check out my tutorial here), orange and yellow ranunculi, red dahlias, lemon blossoms, olive branches with olives (check out my tutorial here), lemons and lemon tree leaves. I made the lemons with modeling chocolate, using a foam center to keep them more lightweight so they wouldn’t rip through the cake. Once the cakes were baked, covered in fondant and thoroughly chilled, I painted the cake tiers. 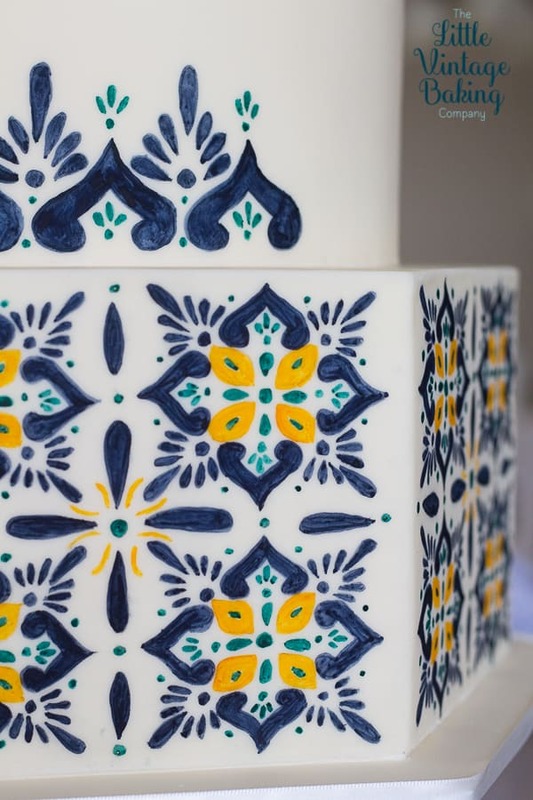 I placed the tracing paper up against the cake and used a dresden tool to lightly trace around some of the main components of the tile design. Just so I could see the outline and spacing of the shapes. The rest of the design I did freehand, just referencing my sketch. I used a mixture of petal dust and grain alcohol to paint the design. The top three tiers were quick and easy to paint. The hexagon tier took hours. Hand painting that much detail takes a lot of time. Before stacking the tiers, all the cakes were chilled completely. I always work with cold cakes as I find room temperature cakes too unstable, especially when using sugar flowers and travelling with multiple tiers. After I stacked the cakes, I refrigerated them over night. I placed the sugar flowers into the cake before delivery. I inserted the flowers into milk shake straws that I placed into the cake. Very rarely do I place sugar flowers on cakes onsite. I don’t have much breakage, if any when I travel with a cake with flowers. I’m super happy with how this cake turned out and I absolutely loved making it. It’s definitely one of my favorites and a good beginning to wedding season. For the peony sugar flower tutorial, click here. For the olive branch tutorial, click here. St. Patrick’s Day is just around the corner! What better dessert to follow your corned beef and cabbage than this chocolate stout layer cake with coffee Irish cream buttercream and Irish whiskey ganache? This cake highlights some of Ireland’s best alcohols – Guinness Stout, Jameson Whiskey and Bailey’s Irish Cream liqueur. The chocolate stout cake is out of this world delicious on it’s own, or with a multitude of fillings and butter creams. But, layering and topping the cake with Jameson Whiskey infused chocolate ganache and a coffee and Bailey’s Irish Cream infused Swiss meringue buttercream takes this chocolate stout layer cake to a whole other level of amazing. I actually have this stout cake on my wedding cake menu. It is one of my most popular flavors for groom’s cakes and is a huge hit with both beer lovers and non-beer fans alike. It’s a rich and chocolaty cake with deep coffee notes and a roasted flavor from the stout beer. When I chose recipes for my business, I chose cakes with a tight, fine grain crumb, moist on it’s own without the need of moistening syrups, and incredibly flavorful, as well as being functional and a good foundation for stacked and tiered cakes. This chocolate stout cake is not only amazing because it tastes phenomenal, but also because it’s crazy functional. Especially, for making into a towering layer cake beauty. It can easily be scaled to make larger and smaller cakes, and it can also be carved for sculpted cakes. The chocolate stout layer cake can be made with any stout beer you like. I used Guinness Stout because it’s easy to find and I enjoy the flavor of it. A chocolate milk stout would be fabulous here. I also baked my cakes in two pans, then sliced (or torted) those cakes into two. You can also divide the batter into three tins and bake as three separate layers if you wish. You can use bittersweet or semi-sweet chocolate for the ganache. The ganache is a standard 2:1 recipe, with two parts of chocolate to one part cream. This will allow you to use it as a drip consistency and as a spreadable frosting-like consistency between the layers. I like to add a little bit of corn syrup and butter to my ganache to allow it to have a bit more softer consistency when chilled. The butter and corn syrup allow it to be a bit creamier and gives it a bit more shine on the drip. Avoid chocolate bark, low quality chocolate chips and candy melts for ganache. Use a higher quality chocolate here. The better quality the chocolate, the better the texture and the taste. I also add a little bit of Irish whiskey – I used Jameson – to my ganache for additional flavor. Allow the ganache to cool until it’s smooth and spreadable, like peanut butter. I use Swiss meringue buttercream for this recipe as I love how well it holds the flavor of the coffee and the Irish Cream. Check out my post on Swiss meringue buttercream for the recipe and tutorial on how to make this silky and delicious buttercream. I flavored the Swiss meringue buttercream with cooled, prepared espresso (you can also use strong coffee) and Bailey’s Irish Cream. The coffee flavor complements the chocolate and the stout flavors from the cake. The Irish cream is the final touch, complementing the chocolate and the coffee so well. They are flavors that are meant to be. It’s so good! Definitely don’t leave out the Irish cream here. I chose to keep the decoration on this cake pretty minimal. I was planning on doing a semi-naked drip but I actually loved how the Swiss meringue buttercream sort of had that two toned messy suede look, so I kept it. To get this look, I iced the cake completely and popped it in the fridge to chill. Once it chilled for 30 minutes or so, I pulled it out of the fridge, and filled in any holes or messy areas with buttercream. I used my cake scraper (or bench scraper) and smoothed the buttercream out completely, which blended both the chilled and room temperature buttercream and created that two tone look and some additional texture. For the drip, I heated the remaining ganache just until it was the same consistency of what it was when I first made it. Then I poured it into a squeeze bottle to add the drips to the cake. You can also use a spoon to apply the drips instead, if you wish. I added the drips first then I filled in the top with the remaining ganache. Work quickly because the ganache wants to set up quickly on the chilled cake. There you have it, chocolate stout layer cake with coffee Irish Cream buttercream and Irish whiskey ganache. After I was done shooting the photos for this cake, part of it went to weekend cake tastings and consultations, but the remainder of it was sent off with my husband to a business meeting where it was promptly polished off. They even sent me a video raving about the cake. It’s THAT good. If you try this chocolate stout layer cake with coffee Irish cream buttercream and Irish whiskey ganache, let me know! Leave a comment in the comment area below and be sure to snap a photo and tag it #littlevintagebaking on Instagram. I love seeing your Little Vintage Baking creations! Preheat the oven to 350F. Butter the bottoms and sides of 2 - 8" x 2" round cake pans. Line the bottoms with parchment. Create a parchment collar to go around the sides of the pans. In a medium bowl, combine the flour, sifted cocoa powder, baking powder and salt. Whisk to combine well. In a measuring cup, combine the buttermilk and stout. Whisk to combine. Place the softened butter and the brown sugar into the bowl of a stand mixer. Using the paddle attachment, cream the butter and the brown sugar on medium speed until it is very light in color and super fluffy, about 6-8 minutes. Add the eggs one at a time, mixing just until combined. Scrape the bottom and sides of bowl with spatula after each addition. Add one third of the flour mixture to the bowl and mix on low until just combined. Pour half of the beer mixture into the bowl and mix on low until just combined. Remove the bowl from the mixer. Scrape the bowl to make sure the ingredients are incorporated. The mixture might look curdled at this point, but it will come back together. Add an additional one third of the flour mixture and mix until just combined. Add the remaining beer mixture and mix just until combined. Scrape the sides and bottom of the bowl to make sure the ingredients are incorporated. Add the remaining flour mixture and mix until just combined. Remove the bowl from the mixer. Scrape the sides and bottom of the bowl to make sure there are not any pockets of butter or flour remaining. Place the bowl back on the stand mixer. With the mixer speed on low add the mayo. Mix for 10 seconds. Combine the baking soda and vinegar in a small bowl. Pour the mixture into the cake batter and mix on low for an additional 10 seconds. Remove the bowl from the mixer. Portion the batter evenly into the prepared pans. Bake the cakes on the center rack of the oven for 40-50 minutes, or until a toothpick inserted in the center comes out with a few crumbs. You will want to start watching for the cakes to be done, when the tops dome and start to crack a bit. Remove the baked cakes from the oven. If they have domed at all, use a tea towel to gently press down the domes. Let the cakes cool in the pans for 10 minutes. Run a butter knife around the edge of the pans, remove the parchment collar and turn the cakes out onto a wire rack. Cool to room temperature. Wrap the cakes tightly with a couple layers of plastic wrap and place in the refrigerator to chill completely before assembling. The cakes will keep tightly wrapped in plastic wrap and placed in a zip top bag in the refrigerator for up to three days. The cake layers can also be frozen, wrapped well in plastic wrap and placed in a zip top bag. I personally don't like to freeze longer than a week, but you can freeze these layers for up to three weeks. Defrost the layers in the refrigerator before using. Place the chopped chocolate and butter into a medium size bowl. Set aside. Heat the heavy cream, salt and corn syrup in a small sauce pan over medium-low heat on the stove until the mixture begins to simmer. Pour the hot cream over the chocolate. Let the mixture sit for a minute to allow the chocolate to melt. Gently whisk the chocolate and cream until smooth. Add the Irish whiskey and whisk to combine. Place the ganache into the refrigerator until it is a thicker, spreadable consistency, like peanut butter, about 30 minutes or so. Work with chilled cake layers. Using a long serrated knife torte the layers, cutting them evenly in half. You will have four cake layers total. The tops of the cakes will be the center two layers of your cake. 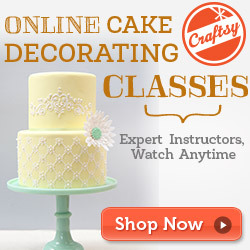 Put one of the cake layers, cut side up onto an 8" cake board or directly onto a cake stand. Spread a thin, even layer of the ganache on the cake layer with an offset spatula. Spread about one cup of the buttercream on top of the ganache using an offset spatula to evenly distribute the buttercream. You're looking for the buttercream to be about 1/4 inch thick. Place another cake layer on top, top up, and press down gently so that the layer is adhered to the buttercream. Repeat the previous two steps, applying the ganache and buttercream. Place the third layer cake layer, top up, and press down gently so that the layer is adhered to the buttercream. Add the final ganache layer. Add the final buttercream layer. Place the final cake layer (the bottom of one of the cakes) bottom side up on the buttercream, pressing gently to adhere. Frost the cake with the remaining coffee Irish cream buttercream. Chill in the refrigerator for 30 minutes. Microwave the remaining ganache in 3-5 second intervals, stirring after every interval until the ganache is loose and pourable but not hot. Add the drips around the perimeter of the cake. Fill in the top of the cake with the ganache and smooth. The completed cake will keep in the refrigerator for up to three days. Bring to room temperature before serving.